ThirdRiver is now working in all 50 states! Through our partnership with Fresenius Kidney Care, and the hard work and service of our consultants, ThirdRiver is now making a difference in all 50 states! We are excited to be sharing the tools of Serving Leadership all over the US. We would like to thank all of our friends and colleagues for their contribution to this success! We could not have done it without such a great community! Mike McCormick discusses how he sees his work as a pastor intersecting with his role as a consultant with ThirdRiver on Serving Leadership. Effectiveness in leadership has a nexus between serving and change leadership approaches. An effective leader continually drives strategic and valuable change while simultaneously responding to the ever evolving business environment and fulfilling the mission of the organization and its employees. In essence, the one style of leadership increases the efficacy of the other. For example, driving meaningful enterprise wide change requires a leader to actively sponsor the change. This is the change leader’s opportunity to “Upend the Pyramid.” A truly active sponsor leads by not only words but by example, modeling the change for their team, finding ways to make acceptance easier by removing operational and political barriers and rewarding for new behaviors through attention and gratitude. Likewise, the effective change leader continually “Runs to the Great Purpose.” Through difficult times of disruptive change, a change leader serves both the organization and the individual through defining the change in the framework of a greater goal. The leader articulates the individual’s sacrifice to the benefit of the goal. The change leader enables the employee to find value and purpose in their daily efforts and accomplishments so that motivations, efforts and results are aligned with the great purpose of the strategic change. Create an appreciation for each approach as an enhancer of the other. In any credible change management methodology, active sponsorship by multiple layers of leadership is the single most influential aspect in managing disruptive organizational wide change. Active sponsorship of a change becomes powerful and more influential when the leader upends the pyramid - removing barriers that inhibit the employee, prioritizing the individual’s objectives according to the greater goal, and specifically working towards making it easier for the individual to change their behaviors. Offer serving leader tactics that operate within the framework of the change management model. Serving leaders build on the strengths of those around them and thereby create a more engaged, productive and content team. Too often when faced with disruptive inevitable change, leaders may respond to employee resistance as lack of will. However, lack of ability is a common cause of employee resistance to change. The serving change leader approaches resistance with more than one good faith attempt to provide information, alleviate fears, prioritize training and reward for positive new behaviors. Work within the cultural boundaries of the organization. The most productive, sustainable and least disruptive way to change an organizational culture is to change individual behaviors. In large complex organizations, changing behaviors on an individual level requires the patience, concern and dedication of a serving change leader. Behaviors are personal. Changing behaviors requires the leader to acknowledge the current culture while raising the bar for the individual. The leader sets a new expectation, demonstrates its importance and finds impactful manners by which to reward the individual. In general, today’s organizational leaders see a connection between leading change and the serving leader. However, to reap the benefits of the two in practice simultaneously, the coach, mentor or trainer should serve their coachee first by identifying the synergy between change management and serving leader. Change can be complex and nuanced. I was reminded of that as I read “How to Lead Change You Don’t Agree With” by Business Matters. Although it would be wonderful to have a “5 Easy Steps to Manage Change,” there are times when ‘easy’ feels too soft of an answer. In this quite interesting, to put it mildly, political season we are experiencing that the old adage “all politics is local” holds true. People are interested in and voting for what they see as impacting them personally- either policy or principle. When discussing managing change it is important to remember that “all change is personal.” People tend to align with a change based on how they see it personally impacting them. As leaders who are looked at as the examples of how to manage a change, there are certainly several compelling things that can be done beside “grinning and bearing it.” I would like to add another layer to recommendations made by Business Matters in their article. It is human to hold both excitement and concern for a change. Employees can see right through a manufactured smile of a leader who is not committed to something. So better yet let’s show our employees through our example that the best leaders can see, think about, and discuss both the benefits and concerns of a change. The best leaders then willingly choose to move forward with the change after deciding that the change is in the best interests and serves the greater goal of the organization. The research on Asset vs. Deficit Based thinking shows that an intentional focus on Assets- what is working, best practices, strengths, opportunities, possibilities, etc.- engages your brain in entirely different ways than when you focus on Deficits- what is wrong, broken, not working, failures, etc. So if you choose to start off with and focus the majority of your thinking on Assets your “Thinking Brain" will function more effectively and powerfully than when you focus mostly on deficits. Focusing on deficits tends to limit your best thinking and put you more in your “Emotional Brain.” While we would never encourage ignoring the deficits, they deserve their due, we do recommend starting off with and spending more time thinking about assets before considering the deficits of any change. A simple but powerful analogy of this point is that of driving a car and looking more out the front windshield than your rearview mirrors. In real life, if you were driving on a busy highway and you choose to look more in your rearview mirrors than front windshield- at best you will be driving backwards. At worst, you would likely cause much damage and suffering. You should reference the rearview mirrors only inasmuch as they help you to move forward toward your destination, while staying focused on looking out the front windshield. The author notes that once a change has been decided upon, movement is critical vs. delaying action on the change. One way that we like to provide comfort for leaders and their teams to move forward on a change is to proactively schedule “After Action Reviews.” These reviews provide regular checkpoints on the successes and challenges of the change, as well as, appropriate remediations where necessary. While “Change Cheerleaders” are often ready to bolt out of the starting blocks with a change, sometimes naively we might add, and “Change Curmudgeons” are usually entrenched against it, sometimes foolishly we might add, there exists a majority in the middle that would be OK with moving forward with a change but are hesitant because they are concerned that the challenges might not be fully thought through. Frequent and well represented checkpoints to review and remediate the change can provide the confidence of a “safety net” to many in the organization. With such a safety net in place, the majority of the organization is enabled to become comfortable embarking on that change. John Porcari is the Serving Leader and Greater Goal Coaching Consulting Practice Director at Third River Partners, LLC, a Leader Development and Strategy Execution consultancy located in Pittsburgh, PA, and serving client everywhere. At the top of the page there is a quote from my colleague Ken Jennings's book, The Serving Leader. "You can't become the best unless others do, too." I want to offer some reflections, coming from a sport that is both individually and team oriented, on teamwork and becoming the best. I have been better than other people at a number of things, but for me becoming the best relates to a competition with myself. The best matters most if I am doing my best. I swam competitively in high school. In addition to my school’s team, I swam year-round on a club team, which meant that during swim season I did two practices a day. The first was with my school team from 3:00 pm to 5:00 pm. At 5:00, I and the other four swimmer from my club team would dry off and go to practice number two. We would "fuel up" on the way over because 5:30 was when the real workout started. Two hours of sprints and drills with long swims and land workouts interspersed. Not that our first practice did not also have drills, sprints, and long swims worked into them too. No, the reason why our workouts at the second practices were so much more challenging was twofold. One we had an excellent leader and coach. Coach Hosea Holder, or "Coach," held us to a high standard. He expected the best from us and told us regularly. Already in his seventies, Coach had been a long time swimmer himself before starting his decades long career of coaching. Coach could encourage us with stories of former swimmers, and in the next moment admonish us for horsing around in the lanes. He pushed us to do our best. So we did. Which is the second reason why the club practices were much more challenging. We were competing, everyday with the competition from other schools. Each lane had anywhere from 2-4 schools represented. We trained 2 hours a day, six days a week, year-round with the very people we wanted to beat. As a result we all got better. What started off as just swimming, led to weight lifting, which led to running, and even sprinting on land to cross train our lungs and muscles. Each day was a race. On my club team, I was painfully slow. Having started as a sophomore in high school, years after many of my teammates had started, I was often placed in a lane with swimmers half my size. Both my sisters started swimming before I did and were much better. So while they swam in lanes with all my friends, I tried to keep up with everyone's younger siblings. But when I got to my school team, I was a rock star. Well, not quite--there were still some swimmers from my club team that could crush me hands down in a race. The rest of the team school, however, consisted mostly of people who only swam during the season and maybe in the summer. And while I swam at school practices, rarely did I push myself. In the lane to my right were the fast swimmers, all from my club team. To my left were swimmers who were new, out of shape, or preferred to goof off during practice. But even if I was better technically at swimming or even faster than the people to my left, I hardly showed it during school practices. No one else was trying hard, so even if I put in a good workout there was no one I was actively trying to "beat." If I would have just swam on my school's team I would have never known how good I could be at swimming. I was never the best compared to others by any means, but I was able to get to my best by surrounding myself by others who were working to become their best. In The Serving Leader the main character, Mike, asks how “being tough on people [helps] them.” The answer that he gets is one that my swimming experience resonates with. “We try to live up to what others expect of us … Expect a little, and we live up to a little. Expect a lot, and we stretch and grow to meet that expectation.” Living up to the expectations of Coach and my club teammates not only made our team better, but it made me better. At school I was given low expectations and I chose not to grow or stretch myself. As leaders, whether at work, home, in the community, or on a team, we grow when we surround ourselves with others who are also growing and raising the bar. 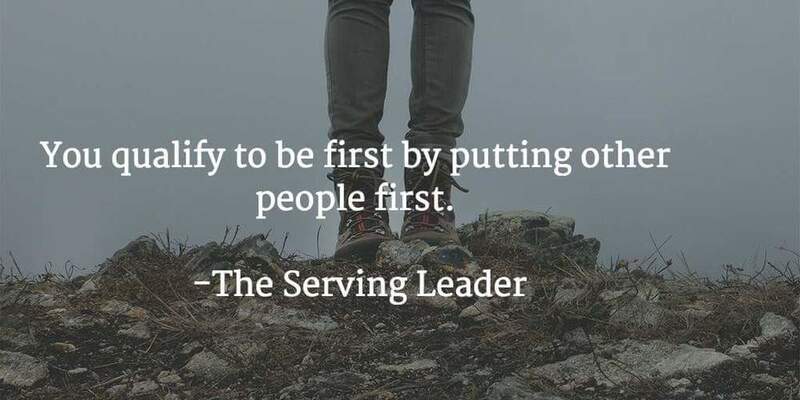 Mike from The Serving Leader sees this principle enacted at the company BioWorks. The leaders there have high expectations for their students and workers. As a result the people who work there begin to actively start changing not just the company, but their own lives. Swimming taught me how others’ expectations for me and for my team could either keep me stunted or push me into greater growth. That’s how Serving Leaders help their people achieve greatness. And that matters because it takes great people to make an organization great. While some may consider this ‘serving’ approach paradoxical, it was the exact approach Jesus taught his disciples. For many years, I have enjoyed a ringside seat observing particularly effective set of leaders. Building upon servant leadership foundations, I see a movement among leaders who put the principles of servant leadership into very practical and effective action. I call them “Serving Leaders,” and I have studied their day-to-day, practical actions for building a talented workforce and achieving extraordinary results. Serving Leaders make productive use of what has been learned through extensive organizational behavior research in expectancy theory, goal setting, and participatory management (Lawler, Locke and others). Research embedded in The Seven Pillars of Servant Leadership, and Jim Collins’ Good to Great, confirms that companies with Serving Leader-led cultures enjoy market returns well above their peers. Shifting to a Serving Leader model can enable organizations to improve in critical metrics, as seen at The Cleveland Clinic, where employee engagement and patient satisfaction measures rose from a lower quartile baseline to exemplary levels following implementation of Serving Leadership. 1. Serving Leaders build on strength by arranging each person in the team, the business or the community to contribute what he or she is best at. This improves everyone’s performance and solidifies terms by aligning the strengths of many people. 2. Serving Leaders blaze the trail by teaching serving leader principles and practices and by removing obstacles to performance. These actions multiply the serving leader’s impact by educating and activating tier after tier of leadership. 3. Serving Leaders raise the bar of expectations by being highly selective in the choice of team leaders and by establishing high standards of performance. These actions build a culture of performance through out the team, business or community. 4. Serving Leaders upend the pyramid of conventional management thinking. They put themselves at the bottom of the pyramid and unleash the energy, excitement, and talents of the team, the business, and community. 5. Serving Leaders run to purpose by holding out in front of their team, business or community a ‘reason why’ that is so big that it requires and motives everybody’s very best effort. *This blog post first appeared on February 8, 2016 on the Christian Leadership Alliance blog.